A federal judge denied a Christian conservative organization’s request for an injunction to fly the Christian flag at Boston’s city hall. In front of City Hall in Boston, there are three flagpoles. One has the American flag, another flies the Massachusetts flag, and the third usually has the Boston flag on it but sometimes flies a flag associated with an event in the city. It’s the third flagpole that really bothers Christian conservatives. That pole sometimes flies flags that they don’t like, like the flags of “Communist China and Cuba” (yes, their lawsuit really refers to China and Cuba in that way). Even worse for them, the Juneteenth flag, the rainbow flag, and the transgender flag have flown from that flagpole. Or, in their wording, it was the “homosexual rainbow flag” and both “Juneteenth” and “transgender” got scare quotes because that’s how serious about equal rights Liberty Counsel is. Related: This guy’s lawsuit said that the rainbow flag is a religious symbol. He just lost. A group in Boston called Camp Constitution applied to host an event to honor Christians and to raise the Christian flag, which they claim is something they earnestly want and is totally not just something they made up so they could whine about how other people got to raise flags but they can’t. The city, of course, said “no.” Raising a Christian flag alongside the American flag and the Massachusetts flag on government property would look a lot like the government is promoting a religion. All religious flags are banned from that pole. The city said Camp Constitution could hold an event nearby and raise a flag, but since they don’t actually care about raising the flag but instead wants the government to favor their religion, they sued. U.S. District Judge Denise Casper was not having it and shot down their claims. Liberty Counsel asked for an injunction, and Casper went through each of their constitutional claims and explained why they probably won’t win anyway. 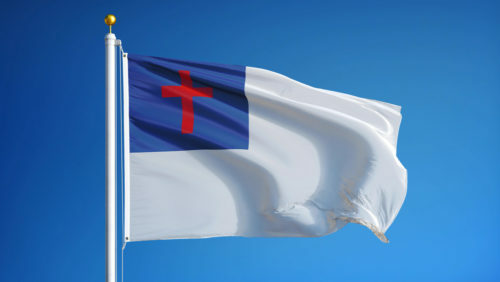 The “primary purpose” of an event to raise a Christian flag “would be to convey government endorsement of a particular religion by displaying the Christian flag alongside that of the United States and the commonwealth in front of City Hall,” Casper wrote. Casper found that the city’s rule against all religious flags was neutral and therefore permissible. She also shot down their whining about how everyone gets to raise a flag but them. Liberty Counsel has said that they will appeal. Related: The rainbow flag is the new Confederate flag? Courthouse News reports that Camp Constitution has not taken the city up on its offer to host an event to honor Christians at a nearby location. Which just shows how insincere this whole exercise was in the first place – Christians don’t feel a need for a special event to honor them because every day is a special event that honors them.